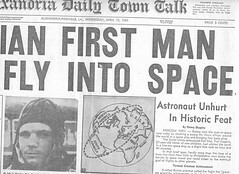 On April 12, 1961, aboard the spacecraft Vostok 1, Soviet cosmonaut Yuri Alekseyevich Gagarin becomes the first human being to travel into space. During the flight, the 27-year-old test pilot and industrial technician also became the first man to orbit the planet, a feat accomplished by his space capsule in 89 minutes. Vostok 1 orbited Earth at a maximum altitude of 187 miles and was guided entirely by an automatic control system. The only statement attributed to Gagarin during his one hour and 48 minutes in space was, "Flight is proceeding normally; I am well." now that's an achievement.. my dream is to go into space in my life time.. I'm sure it'll happen.